Dorset Campbell-Ross (U.K./Australia) has been a counselor, lecturer and seminar leader since 1992, specialising in communication and relationship skills. A Certified Trainer with the Centre for Nonviolent Communication (CNVC), an NLP Master Practitioner and Hypnotherapist, he has conducted business and personal relationship trainings in the U.S., U.K., Ireland, Greece, Malaysia, Indonesia, Australia and New Zealand. 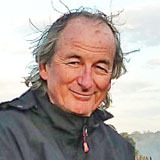 He has mediated between groups of people in conflict in Ireland and Australia. Earlier in his life he worked internationally as a musician, and also created and sold a successful trading company importing from Indonesia. Using audio visual aids, puppets, singing songs and playing guitar, Dorset creates a safe and supportive learning environment and his trainings are engaging, entertaining, humorous, interactive, and experiential. Living in Byron Bay, Australia, he has trained more than 1000 people in NVC, established ongoing practice groups, and has a private practice mediating and coaching individuals, couples and families in NVC, both in person and by telephone. In 2010 he formed a partnership with two other CNVC trainers, Linda Rysenbry and Shari Elle, to create the Embodying NVC Consciousness Training. This is an 8 month ongoing program consisting of 3 x 5 day residential total immersion retreats; 3 webinars given by local and international trainers on subjects directly related to broadening and deepening NVC consciousness; bi-weekly NVC coaching; and weekly empathy buddy sessions. In 2013 he was invited by CNVC to be one of the four CNVC trainers at the first ever 9 day International Intensive Training in Kenya, Africa. 47 African peace activists from all over Africa gathered to experience a deep immersion in NVC. He was both inspired and encouraged by the engagement of the participants. He continues to teach regularly in Indonesia, where he was invited by the hospital staff to be the Crisis Centre manager at the Sangla Hospital immediately following the Bali bomb in 2002. This experience affected him deeply and inspired his desire to became a peace activist through teaching and living Nonviolent Communication. Since then he has offered NVC pro bono in Aceh, Djakarta, Bali and Papua, to give back something in return for all the love that he has received since his first visit in 1970.